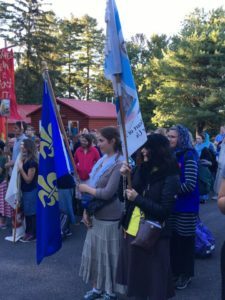 Pilgrim families & seniors arriving Sunday are most welcome to join other pilgrim families & seniors already on pilgrimage as early as 10:00am Sunday morning at the Shrine in Auriesville for special, new events there. Families & newcomer pilgrim-friends will gather at the Pavilion, across the parking lot and wide-open lawn from the Shrine Visitor Center. You are cordially invited to participate in a spiritual talk or two for adults and children, starting at 10:15am, a shared lunch at 11:00am, and Confessions and children’s activities at 11:40am. Feel free to bring a simple dish to share!